It was a race against time to get a card made tonight, but here it is! 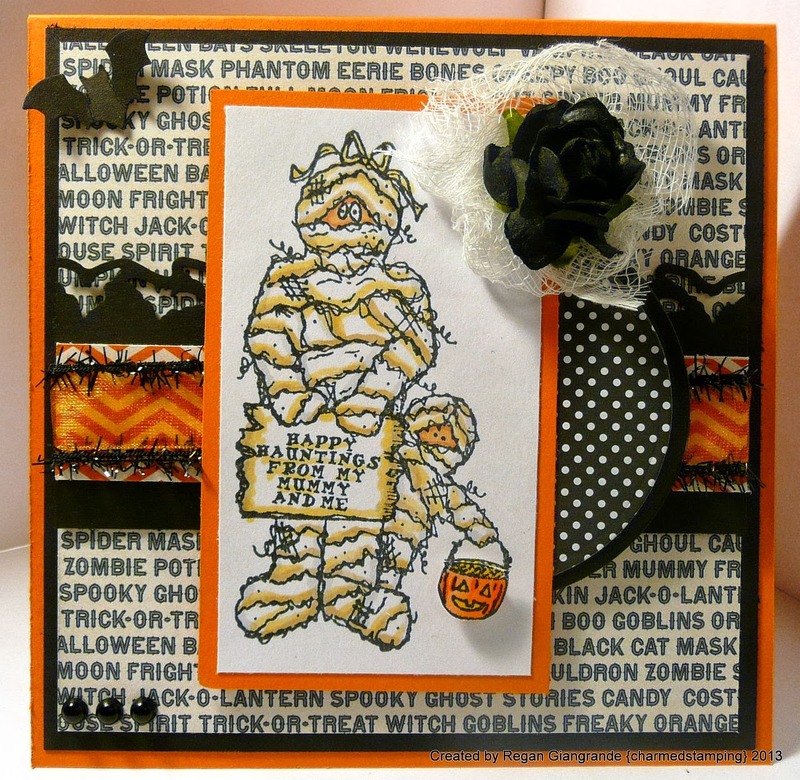 I made some happy mail for a friend using this adorable Mummy and Child stamp from Rubbernecker Stamps. I have had it for a couple of years now and I decided it was far too cute to sit in a tote, uninked. I colored them with Copics which was easy since they are mostly bandages. 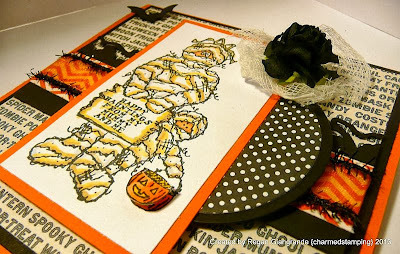 I then used this fun sketch from Sunday Sketch & Stamp (#179) to put together my card. Papers are My Mind's Eye - Haunted. For details, I added a bit of cheesecloth, ribbon, a black rose, Martha Stewart punched bats, and a few black pearls. We went to visit my parents' tonight which was nice. We missed them last week because they were away during the week and we had plans on the weekend. My small man loves his time with them so it was nice to hang out and relax there tonight. And I got to see his finished Halloween costume as my talented mom put on the finishing touches! I cannot wait to get him all dressed up in it!!! He seemed pretty excited too! For three of his four Halloweens so far we have dressed in coordinating costumes. His first Halloween we were both referees. The next year he was a dragon (A-DOR-A-BLE!!!) but I didn't dress up. Then he was Frankenstein and I was Mommy of Frankenstein (That was the year we got buried with an October snow storm!). Last year I was Cruella De Vil and my mom made him a Dalmatian puppy costume. I'm not sure if I can pull off a costume with him this year, and I'm a little sad. But we'll see. There's still time after all and it is my favorite holiday! I hope you are having a wonderful week so far! Thanks for dropping in! 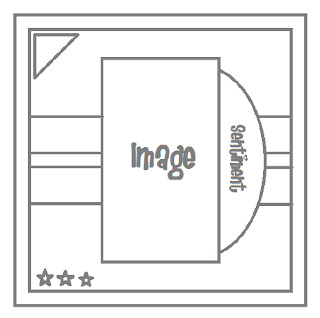 Markers used: Copics (E00, E11, E21, E31, Y23, Y35, YR00, YR02, YR04, YR07, N0). Love the design and all the embellishments and elements. Thanks for joining in at Crafty Boots Challenges this time. I just love this card its super. Great Halloween card. Wonderful design and fab image - I love the sentiment! Thank you for sharing your work with all of us at Crafty Boots Challenges. Scary CUTE! Thanks for joining us on the Kaboodle Doodles Challenge Blog! 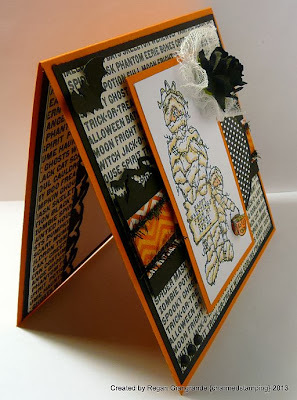 Perfect Halloween card, love all these layers and this background paper is super! I would like to thank you for entering my ‘C… is for challenge’ blog and I wish you good luck in the draw. What a great card. It was a perfect fit for our challenge this week and I thank you for stopping by to share.